Maharashtra Security Guard Notification 2018: Candidates we are come up with the latest recruitment Notification. The candidates who are searching for latest notification from MSSC. 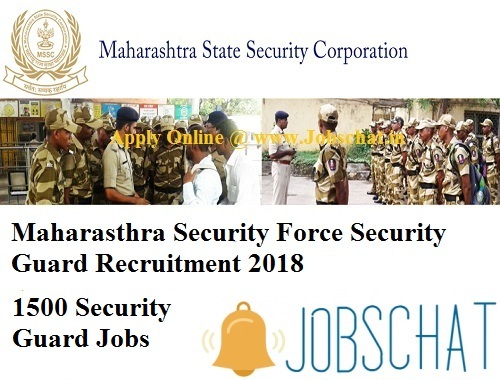 Maharashtra State Security Corporation Released the Maharashtra SSC Security Guard Recruitment 2018. The MSSC Organization came out with 1500 vacancies in Security Guard Posts of which 1000 are For male and 500 For Female Candidates. Those who interested candidates you may check the MSSC entire details. The Maharashtra State Security Corporation Security Guard Application Form are available in online application forms from 19.09.2018 onwards. Here we are providing the Maharashtra Security Guard Recruitment 2018 details in below. Aspirants searching for more latest Maharashtra State Jobs can check here. Candidates should have passed HSC from recognized University or Institution in First Class. Aspirants to apply for the Maharashtra Security Guard Recruitment 2018, Must have the Age Limits as on 30.09.2018. Candidates will be selected for the Security Guard Jobs as per the MSSC Security Guard Notification 2018 which may contain the Written Examination/ Interview. Selected aspirants will get the best salary as per the rules of the Maharashtra Government. Candidates must pay Rs.300/- as their application Fee which is Non-Refundable in NEFT Mode to HDFC Bank Limited., HDFC Current A/c No. 50200029300297, Branch- Churchgate Industry House, Churchgate Mumbai, IFSC Code – HDFC0000501, Maharashtra State Security Corporation. Through this page, we are giving complete details which are related to the www.mahasecurity.gov.in Security Guard Recruitment 2018. The MSSC Officials will conduct the selection process like written test and interview. Aspirants who qualify the written test they have Interview. the selected candidates will get the best salary as per the rules of the Maharashtra Government of Rs. 14,000/- per month. The MSSC Officials will conduct the written test shortly. We mentioned the latest MSSC syllabus, previous papers, here where it may be used by the Applicant for the preparation. Go to the Home page and search for the link MSSC Female Security Guard Recruitment 2018 Notification. Check the Details and Open the Maharashtra Security Force Security Guard Online Application By opening in new window and Fill the complete details. Pay the Fee and submit the Application after checking the mistakes. After submitting the details take the print out.